Ska originated in Jamaica in the late 1950s, and was the precursor to rocksteady and reggae. Ska combined elements of Caribbean mento and calypso with American jazz and rhythm and blues. It is characterized by a walking bass line accented with rhythms on the upbeat. In the early 1960s, ska was the dominant music genre of Jamaica. Around 1966 came Rocksteady the precursor to reggae, Rocksteady uses some of the musical elements of rhythm and blues (R&B), jazz, ska, African and Latin American drumming, and other genres. One of the most easily recognizable elements, as in ska, are offbeat rhythms; staccato chords played by a guitar and piano on the offbeats of the measure built around the "one drop" drum beat, characterized by a heavy accent on the second and fourth beat of every bar, played by the bass drum and the snare together. We are proud to present to you The Ska & Rock Steady Revival Tour featuring The Melodians & Monty Morris backed by The Yellow Wall Dub Squad. The Melodians are one of Jamaica's greatest Rocksteady groups, cutting a series of classic singles during the late '60s and early '70s that included the internationally famed "Rivers of Babylon" and "Sweet Sensation." This year 2013 marks the celebration of The Melodians Golden Jubilee—50 year's in the music business. The Melodians formed in 1963, "Tony" George Brevett met "Porky" Brent Dowe in Greenwich Farm and brought him to Kingston town to meet "Trevor" James McNaughton and Bramwel Brown. It was at this juncture The Melodians were formed— Brent and Tony sharing Tenor and lead vocals, Bramwel Brown singing Falsetto and Trevor McNaughton singing Baritone. For the next few years, the group performed at Kitimat Night Club where they met Ken Boothe who introduced them to Coxsone Dodd at Studio One. In 1966 they recorded their first recording—" Lay it on" and "Meet Me There" at Studio One. In 1967 Bramwel Brown left the group and the three Tony, Brent and Trevor went on to Duke Reid's Treasure Isle Label recording successfull hits "You Have Caught Me," "Expo 67," "I'll Get Along Without You," "You Don't Need Me" (which featured U-Roy), and "Come On Little Girl" thus establishing The Melodians as the sweetest-sounding vocal trio on the Rocksteady circuit. Eager to exert more control over their destiny, the trio joined fellow artists, The Gaylads, Delroy Wilson and Ken Boothe, in launching the Links Label. Although their resulting release on the label, "Sweet Rose", "It Comes and Goes" were popular, internal disputes among the artists resulted in the demise of Links records. In 1968,The Melodians left Treasure Isle and joined up with producer Sonia Pottinger releasing two more hits, "Little Nut Tree" and "Swing and Dine." Late in 1968, the trio joined Winston Lowe's newly launched "Tramp" label, where they continued to supervise and produce their own material, which included "When There Is You", "Ring Of Gold", "You've Got It" and "Personally Speaking". In early 1969 they returned to collaborate with Reid, cutting a number of titles the most notable being, "Everybody Bawlin’"
Bony M, who enjoyed international success scoring over a million sales and becoming the second highest selling single in the UK in 1978, copied “Rivers of Babylon”. Towards the end of 1972, the trio returned to work with Duke Reid for a last time to record "Passion Love" and "Love Makes The World Go Around" and also reunited with Sonia Pottinger yet again to cut "Black Man Kingdom Come". In 1973 Dowe left the group, despite "Rivers of Babylon" finding a whole new audience via its inclusion on Jimmy Cliff's soundtrack for The Harder They Come, The Melodians disbanded. Dowe and Brevett both went on to record solo singles. Brevett, had already recorded material without the group, including "You Took Me By Surprise" for Martin Riley, the Bunny Lee-produced "Don't Give Up", and a number of self-produced singles, most notably "Don't Get Weary", "Over Hills and Valleys", "So Ashamed" and "Black Girl". Following the break-up of The Melodians, Brevett cut a series of excellent singles, "Words of Prophesy" for Israel Rockers label, "Star Light" for Planit, along with "I've Got To Get Back Home" and an updated version of "Over Hills and Valleys" for Vivian 'yabby u' Jackson. Meanwhile, Dowe, who had previously cut solo sides for Byron Smith and Leslie Kong, proved even more prolific, recording a number of popular singles for Pottinger, resulting in his debut album, Build Me Up, issued early in 1974. Over the next few years, Dowe continued to work with Pottinger as well as recording "Down Here In Babylon" for Pauline Morrison, a re-make of "Your Turn To Cry" for Prince Tony Robinson and "Things You Say You Love" and "Come On Pretty Woman", both issued on the Virgonian label. Like Brevett, he also produced a number of his own recordings, most notably, "A Deh Pon Di Wicked", "No Sweeter Way" and "Unfaithful Mankind." Throughout the remainder of the 70’s, Brevett, Dowe and McNaughton occasionally re-formed to record, with their collaborations including "Dry Up Yuh Tears", "What Am I To Do", "It's All In The Family" and a version of the drifters "I'll Take You Where The Music's Playing" for Pottinger, and "Why Little Girl" along with remake of "Passion Love" for Channel One. Other releases bearing their name included "Don't Let The Sun Catch You Crying" and an updated version of "Swing and Dine" for Harry J”s (Harry Johnson), a Vivian Jackson-produced single, "Stop You Gang War" B/W "Learn to Love One Another" and three singles issued on the Studio One Label: "Burning Fire", "Loving Feeling" and an updated version of "Little Nut Tree". In 1983 the trio re-formed and recorded the album, Irie Feelings for Ras Records, who also issued "Warning" "Push a Little Harder" as a single. That same year UB40 covered "Sweet Sensation" on their hit Labour of Love album. In 1992 they recorded "Song of Love"—issued on the Tappa Zukie Label. Throughout the later 90’s they continued touring internationally, performing their classic hits.as well debuting appearance at The Sierra Nevada World Music Festival in California in 2002. Thus resulting in the urge to hit the road and spread their message. 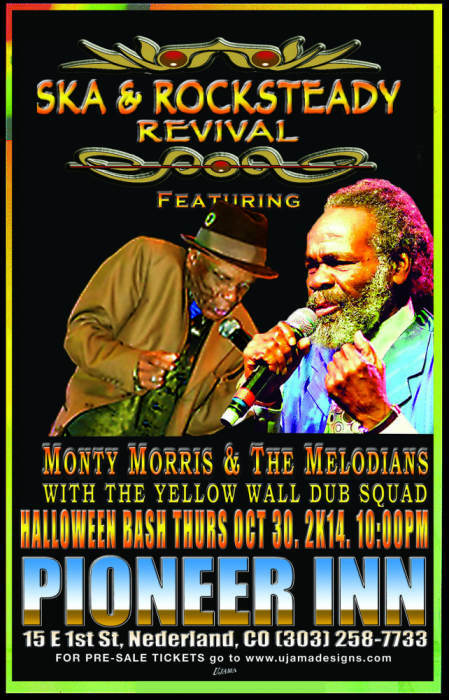 In November 2005 they embarked on a successful West Coast Tour backed by the Yellow Wall Dub Squad, revving their presence on the touring circuit. On the evening of Saturday January 28, 2006 after a rehearsal in preparation for a performance to take place the following weekend at the Jamaican Prime Minister’s residence, Brent Dowe, at the age of 59 suffered a fatal heart attack. The remaining original members Tony Brevett and Trevor McNaughton.have continued touring in Europe and the US as well as recording in honor of Brent Dowe. In 2013, in Celebration of their 50th Anniversary—being their Golden Jubilee The Melodians released a new album "Lyrics to Riddim" a dedication to Brent Dowe. The album features 17 brand new original unreleased tracks of which six were recorded prior to Brent's untimely passing. Lyrics To Riddim was produced be Willie Lindo, best known for his work with Beres Hammond (One Step Ahead, What One Dance Can Do) and Dennis Brown (Inseparable) who in the 1970s was a session guitarist at Federal Records in Kingston. "We never really got the recognition I think we deserve,” says Tony Brevett" “We’re trying to prove ourselves. All the hard work that we did. Every night we rehearsed. But we still come up with new ideas and put them all together. I think that is what keeps us going, the good work that we do. “All the songs on Lyrics to Riddim are new and original. It's a nice album, it brings back a whole heap of memories cause we jus' decide to stay with the rock steady feel," Lindo said. Not only did Willie produce the album he played on it alongside drum-and-bass team Sly and Robbie, keyboardist Robbie Lyn, saxophonist Dean Fraser and trombonist Nambo Robinson. Throughout 2013, The Melodians toured across the US, in celebration of their Golden Jubilee —50 years strong. Unfortunately in August 2013 Tony Brevett was diagnosed with cancer and thus succumbed to his illness and passed on October 25, 2013. Trevor McNaughton continues carrying the legacy and thus will be touring during the Spring and Summer of 2014 in tribute to Tony. In the Autumn of 2014, Trevor will return to the studio to work on some new material with a target release for early 2015. Considered to be one of the foundation artists of original ska, second only to Derrick Morgan in popularity the elder statesman Eric “Monty” Morris, was born in St Andrew Jamaica on July 20th 1944. The young Monty loved music and could often be found at the sound system dances of the 1950s when US style R&B was the order of the day. Like many fellow legends of the period, such as Alton Ellis and Eric’s friend and neighbor Derrick Morgan, he was a contestant on Vere Johns’ Opportunity Hour talent show, and began a recording career in 1959. He voiced for Duke Reid, Prince Buster, Byron Lee and Clancy Eccles, repeatedly topping the Jamaican charts. His penchant for adaptation stretched to folk songs like Oil In My Lamp’, and Penny Reel’. This however, should not detract from Morris’ bona fide song-writing skills as he penned tracks like ‘Money Can’t Buy Life’, ‘Say What You’re Saying’ and ‘Sammy Dead Oh.’ and Oil In My Lamp. In 1964, he joined an excursion to the New York World’s Fair, organized by Edward Seaga, to sing with Byron Lee and the Dragonaires. Ska failed to capture the imagination of the American public until after the movement had ended, while the “Wild West” mentality of the Jamaican music business, coupled with the singer’s soft temperament, left him short of the financial rewards gained by some of his peers, so in 1970 he retired to the United States. Yet his memory burned strong the minds of the US Caribbean community and he was eventually tempted back to record for the Washington DC Kibwe label in 1988. 1999 even saw a triumphant return to Jamaica after 3 decades for the concert series Heineken Star Time. In 2002 ‘Say What…’ was revisited by Beenie Man for his Tropical Storm set when he duetted with Janet Jackson on the single, ‘Feel It Boy’. In 2003, his "Enna Bella" was used in the soundtrack of Jim Jarmusch film Coffee and Cigarettes.